Laura Massaro will have more reason than most to enjoy the countdown to New Year on Thursday night as it will bring with it the last major prize in squash. The 32-year-old from England, who won the British Open in 2013 and became world champion in 2014, will become world number one for the first time on 1 January. 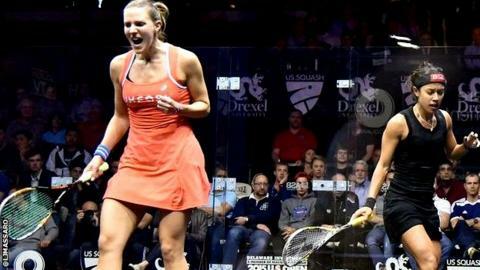 "Having already won a British Open and a World Championship, it was probably the last box to tick, so for me it is absolutely massive," said Massaro. "There's nothing planned but, as it will be New Year's Eve, I'll be with friends and family and can celebrate as the clock ticks down." Massaro, from Chorley, will be England's third female number one and the first since Cassie Campion in 2004. But just eight months ago her form was so poor she decided to take a break from squash for the first time. Defeat by compatriot Emma Beddoes in the second round of the Windy City Open in March brought matters to a head. "My disappointment had nothing at all to do with the quality of my opponent and I didn't feel unmotivated," said Massaro. "I was just losing matches and didn't know why. "I was giving 100%, I just wasn't able to play the level of squash that I wanted. "It was the people around me who said I looked tired and exhausted and needed a break to see where I wanted my squash to go. "I'd been on tour 12 years without a break. It wasn't for lack of trying but there was something missing." Massaro follows in the footsteps of Lisa Opie (1988) and Cassie Campion (2000 and 2004) as England's third female world number one. She takes over from Egypt's Raneem El Welily, who held the position for four months after ending Nicol David's run of nine years and one month at the top. It was hearing a similar story from a different sport that helped convince Massaro she should actually take a five-week break from squash. "I did and thought it's exactly how I feel. She had won Wimbledon just a couple of months after I had won the worlds and it was almost like we were on the same path. "Danny and I went on holiday and I finally started to wake up not thinking about squash. The fog started to lift and I could see where I wanted to go in the future and that I had more to give to the sport. "You don't want to take time off, but I came back and changed my physical trainer, shifted a few things around to get a little bit of freshness back and a new direction, and it's all worked really well." Massaro returned to action at the British Open in May and quickly demonstrated the rejuvenating effect of her time off with a stunning semi-final victory from two games down against world champion Nicol David. She could not finish the job, losing to France's Camille Serme in the final but felt vindicated by her change of approach. "I made the final of the British Open... that reinforced it was the right decision at the time," said Massaro. "I've made a conscious decision to take a little bit of a break sometimes," she said. "That's the deal I've made with myself... train hard but try and have weekend breaks and three or four days off every now and then. "But when I'm in my training zone, I'm working perhaps harder than I've ever done before." Massaro will replace Egypt's Raneem El Welily at the top of the rankings on 1 January, but it is Malaysia's David, currently ranked third, who has been the sport's dominant force over the past decade. The 32-year-old has won eight of the past 10 world titles and was world number one for a record nine years until July. "Nicole will go down as the best female player in history with the success she's had," said Massaro. "We came through juniors together, and on one hand it's been unfortunate to be there with someone who's been so successful. "But she's driven the sport forward and I've been part of trying to catch someone and eventually been able to raise my level to beat her on a fairly consistent level... probably a lot more than anybody else. "I try to look at it as would I be the player I am if there wasn't someone at the top of the sport pulling away all the time, with me trying to hang onto their heels and drag my own level up?" Massaro's rise to the top of the rankings was hastened by the postponement of the women's World Championship, due to be held in Kuala Lumpur from 11-18 December, as it denied her opponents a chance to win points before the new January rankings. It is the second time in three years that the women's premier event has been postponed. Massaro will never match the Malaysian's incredible list of titles, but her immediate goal is to hang on to the number one ranking and then push the boundaries of what is possible for women's squash. "As number one, my level is obviously the best in the world at the moment and I just have to try and keep improving, so other people are looking at me as though that's where we need to be and who we need to catch," she said. "That's a nice goal for me to set my sights on."